The American Political Science Association awards the prize annually to the best book from the past year on government, politics or international affairs. For “American Grace,” Campbell and Putnam conducted some of the most comprehensive studies ever conducted about religion in American society and examined the ways religion influences the nation’s political and civic life. One of the most interesting findings from the American Grace study, Campbell says, was that mainline Protestants now make up only 14 percent of the population—and are now outnumbered by the 17 percent of the population with no religious affiliation at all. Additionally significant were the discoveries that Americans have begun switching their religion to match their politics—rather than the other way around—and that most Americans (including those who are secular) believe that people who are personally religious are more trustworthy and make better leaders. Notre Dame President Emeritus Rev. Theodore M. Hesburgh, C.S.C., calls the book a “must-read” for anyone interested in the role of religion in America’s civic life. “Their findings from rich case studies and sophisticated analysis of original national surveys will be of great value to academics, politicians, community organizers, religious and non-religious leaders, and American citizens who wonder about why and how religion continues to matter so much in American civic and private life,” he says. 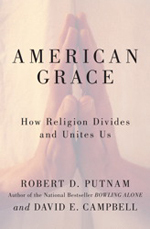 “American Grace” was also honored by the Religion Communicators Council, which awarded Campbell and Putnam its 2011 Wilbur Award for the Best Nonfiction Book. 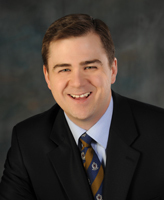 With funding from the National Science Foundation, Campbell is beginning a new project with Geoffrey Layman, associate professor of political science at Notre Dame, and John Green at the University of Akron, to study the political implications of the rise in secularism. Originally published by Joanna Basile at al.nd.edu on September 09, 2011.